A brief history about how a colorful bird morphed into a wizard. Back in late 1993 a small group of people gathered in a living room to hatch a bird. 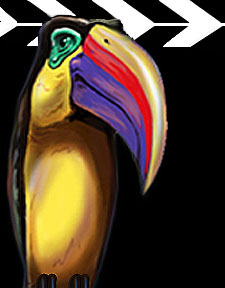 A toucan to be exact. Toucan Studios began life as a company devoted to bringing quality video production to smaller companies. For every HP or IBM spending $40,000 on 5 minute videos to play at employee meetings or at tradeshows, there were hundreds of companies needing quality video productions, but at only 10-20% of that budget. We produced several 3-10 minute videos in our first 3 months in business. Unfortunately, one company (the 10-minute video) went bankrupt days after we delivered the video and their owner disappeared. Scratch 45% of our earning for that quarter! Soon, companies like Apple Computer called asking if we could create interactive products to be delivered on CDs. Sure! No problem. One of us had produced about 30 interactive CDs in the previous 3 years. Apple also wanted to put QuickTime video on these CDs, but in a window size that was about twice the standard at the time and at a smoother frame rate than 8-10 fps. Sure. No problem! All we had to do was to rewrite some of the basic player software... figure out how to best process the video to that larger size, and then make sure it ran on all color-capable Macintosh computers. Within the year, Apple came back asking us to produce full-screen videos playing at 30 frames per second (about 4 times larger than standard QuickTime playback at about twice the normal frame rate!) Oh... and it needed to be installed on three brand new Macintosh computers being introduced at a big event in New York in 8 days. Sure. No problem! Just had to beg, borrow and steal prototype video cards capable of that kind of playback from one vendor, create the self-running, looping video in three different versions, get large hard disk drives that were never meant to be installed in those computers and install them, digitize the video and get it onto the hard drives and get the set of them packed up and out the door for overnight delivery. At least our work got pictured on the cover of Newsweek along with John Sculley. That was followed by creating several CDs that were shipped with the first 3 million or so Power Macintosh computers, the creation of a paced, 4-room exhibit at Walt Disney's EPCOT and many other projects for high-visibility clients. In 1995 we were approached by a major database company, Baan, to create their first US website (Baan is a company located in The Netherlands). Could we create a 150-page+ website? Sure. No problem! All we needed to do there was to learn how to hand code HTML in under 2 days and to start. Heck... we really hadn't had our own website up for more than a week or so when that call came in. 1996 saw one of our partners leaving the company and moving north. With his departure came the decision to become a corporation with a new name (a whole other story). 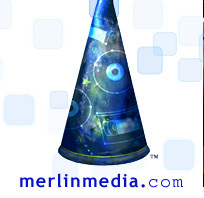 After months of agonizing, we decided on Merlin Media, Inc.
And so it goes and goes. Our attitude of "sure... no problem" carries through into everything we take on. Practically every major project breaks some new ground. Pushes the envelope of a particular development tool. Needs to run on so many disparate platforms and versions of software that most companies would just say "no!" But, that isn't Merlin Media. From our early days of putting a 12-screen self-paced slideshow with 3 minutes of music on a floppy disc up to one recent project that has us placing hundreds and hundreds of narrated screens with hours of audio and dozens of video segments, all in three languages onto standard DVDs plus including several interactive tests... Merlin Media can do. No problem!